Are you tired of seeing an update like this on your Mac? Adobe asks you to download and install an update to Flash Player because they have made some significant improvements in the new version? Years ago, Adobe confirmed that they have a major security vulnerability related to Flash Player, as discovered by Trend ﻿﻿Micro and reported BGR. There doesn't seem to be signs that those vulnerabilities are completely fixed as Adobe keeps releasing new versions for their Flash Player app. 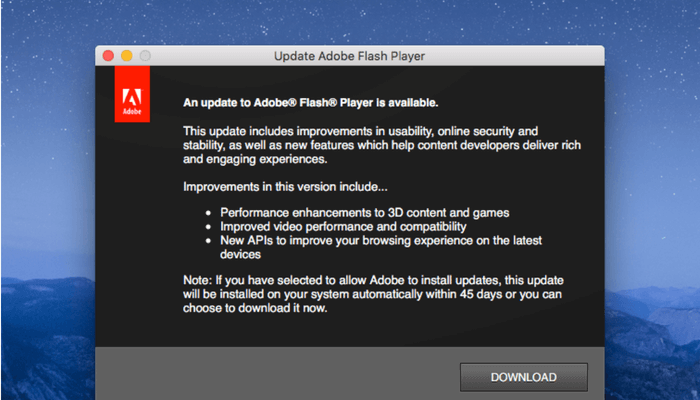 While updating Flash on Mac is just a few clicks away, I found the process tedious and most of the time — unnecessary. Because unlike the old days we had to use Adobe Flash Player to view web videos as they were mostly encoded in Adobe’s proprietary Flash format. Not anymore! These days modern web browsers (i.e. Safari, Chrome, Firefox, etc.) all work seamlessly to YouTube, Vimeo, and many other live streaming web services — leaving Flash Player off the table. 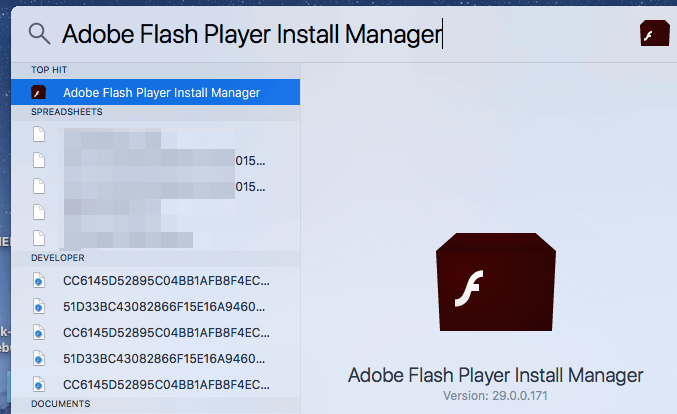 So, it makes sense to uninstall Adobe Flash Player from your Mac so you won't be bothered by the annoying updates and potential security issues. In this article, I'm going to show you how to do that step by step. Note: two methods are introduced in case the first one doesn't work out. Please note that the screenshots below are taken from Flash version 29, based on macOS High Sierra. If your Mac is running an earlier macOS or an older version of Adobe Flash, minor user interface differences may apply. Step 1: On your Mac, go to Applications > Utilities, find this app "Adobe Flash Player Install Manager". Click to run it. Alternatively, you can do a quick search on Spotlight and select the "TOP HIT" result. 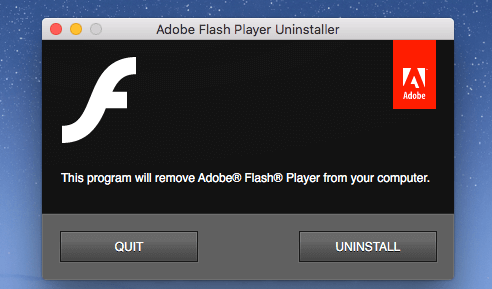 Step 2: Click the Uninstall button in the new window called Adobe Flash Player Uninstaller, where it says "This program will remove Adobe Flash Player from your computer." Step 3: Input your Mac's username and password and select "Install Helper". Personally, I find this annoying but there isn't a way to avoid installing the Adobe helper tool. Note: the helper tool by Adobe is harmless. It's common for third-party applications like Adobe to ask user's permission to perform certain tasks such as removing items with special permissions, uninstalling items from Mac App Store, etc., because macOS puts many limits restrictions on this. Step 4: DONE. A new window pops up saying Flash was removed from my system. 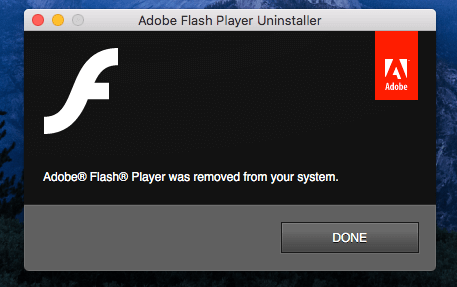 This is the recommended yet standard method for deleting Flash Player from a Mac. It should take you less than a minute to complete. 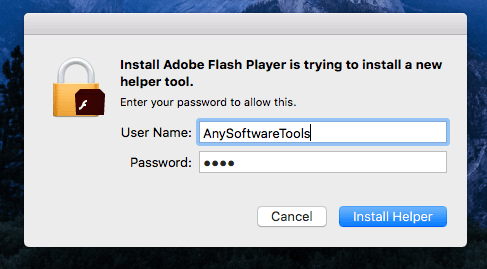 The only downside of this method is that once you uninstall Flash Player, you end up with installing another Adobe app — the Helper tool. Some Mac fellows reported that they encountered issues using the Adobe Flash Uninstaller app on their Macs, it's unclear what caused that. But if Method 1 didn't work out for you, turn to the second method — it's even quicker. CleanMyMac 3, is an app developed by MacPaw Inc. that aims to make Mac cleanup and maintenance easy. While its core features are related to cleaning, the app also allows you to quickly uninstall third-party apps or extensions in batch, and removing Adobe Flash Player can be achieved easily as well. Open it. On the left part of the main panel, find Extensions > Preference Panes, there you should be able to find "Flash Player". Select it and click the "Remove" button. That's it. Pretty easy, right? It's worth noting though, CleanMyMac isn't freeware (it has a free trial). We use the app quite often on our Macs and it works amazingly well and has saved us tons of time handling complex/techy tasks such as freeing up disk space, cleaning third-party apps or launch agents, finding large old items, and more. The app is definitely a productivity booster for most Mac users, especially if you are not a computer person. 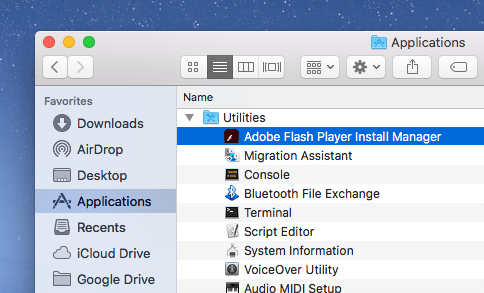 Additional tip: Adobe actually has a dedicated article here in case you failed to install or uninstall Flash on your Mac. For example, an error message appears. There you'll find detailed troubleshooting guide. 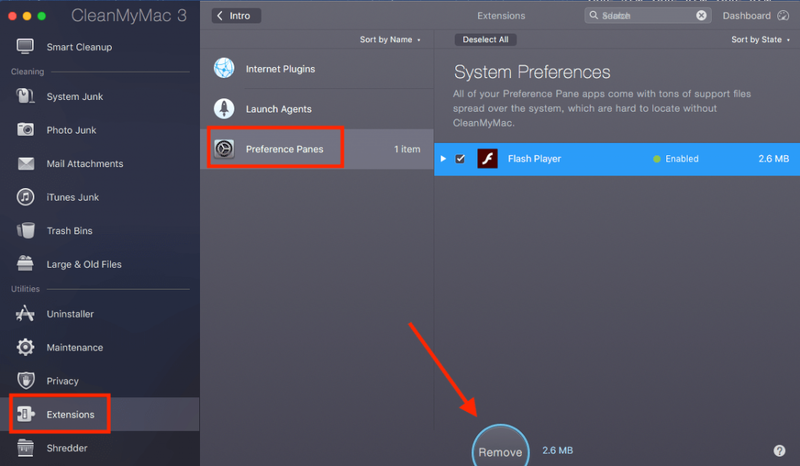 Alright, now that we've shown two ways to get rid of Adobe Flash Player from your Mac. Are they helpful? Or do you have another "secret" way to help get the job done? Either way, leave a comment below and let us know.